The resurgence in interest in growing old-fashioned flowers has helped the nasturtium make a comeback in gardens. The flowers have a delicate fragrance that many people will remember from grandma’s garden. The nasturtium is a versatile plant that can be used for edging in flowerbeds or in window boxes, patio containers, or hanging baskets. The abundant, colorful blooms can be cut for use as an elegant entree garnish or salad decoration. The leaves, which contain a good dose of vitamin C, can be used to add a peppery flavor to fresh salads. Tropaeolum minor, the scientific name for the nasturtium, comes from the Greek word meaning “to twine,” which is descriptive of some of the 50 species in this genus. Nasturtium was first found growing in Mexico and Peru where it was used instead of cress to flavor foods. It was brought to Europe in the 16th century and considered a symbol of conquest and victory in battle. Victorian women later used it in tussie mussies to ward off bad smells. Nasturtiums come in three types: dwarf, semi-trailing, and single flower climbing. Dwarf types are bushy and compact and include the cultivars ‘Alaska’, ‘Empress of India,’ ‘Strawberries and Cream,’ and ‘Whirlybird.’ Semi-trailing types reach a length of two to three feet, making them ideal for hanging baskets. The Gleam series is a good choice here, having been named an All-America Selections winner in 1935. The single flowering climbing types like ‘Jewel of Africa’ send out six to eight foot runners that climb trellises like vines. Colors of this type are bright and range from yellow and orange to rose and crimson. Vines are strong and have fragrant flowers. 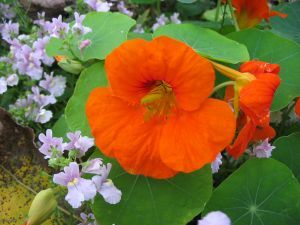 Nasturtium is one of the easiest flowers to grow from seed. The best flowering will be in full sun, but they will tolerate partial shade. Seeds can be sown directly in the garden beginning in late May or started indoors to get a good head start on the season. However, as nasturtiums do not fare well when transplanted, use peat pots and plant these directly in the soil. Nasturtiums are not choosy about their soil, but, given a choice, do prefer a light, sandy soil. Don’t spoil them with rich, fertile soil and fertilizers as this will only result in lush foliage and few blooms. The large seeds of nasturtiums are easily held by tiny fingers, making them a good flower for children to help plant. In addition, the seeds germinate quickly and plants grow rapidly, so children can see the results of their nurturing soon.